As a child in 1980, going into the 4th grade, though, this show was magic, with dark tales of science fiction and horror given illumination by the contrastingly light performances of Baker and his onscreen traveling companion Sarah Jane Smith, played by Elizabeth Sladen. I loved their relationship, which was clearly one of great fondness for each other. I loved the Doctor’s long coats and immediately set about trying to find one of my own (it would be a few years before I managed it). And, of course, I loved his scarf, but it would be another 20 years before I was finally given a replica of the Doctor’s first one, as knitted by my mother-in-law; instead, I had to make do with wearing my dad’s girlfriend’s cream-colored muffler for the first few years instead, which only looked like Baker’s scarf after being filtered through my imagination). I loved the Doctor’s grinning manner, his gadgets and I loved his habit of offering everybody Jelly Babies (which, in lieu of, I had to make do with Gummy Bears). And I especially loved his mode of transportation, the TARDIS. Standing for Time And Relative Dimensions In Space (though some sources vary), the TARDIS was a blue police public call box that was, though dimensional shifting, bigger on the inside. (Had to get my dad to explain that one to me.) The Doctor would step through the doors of this glorified, over-sized phone booth, into apparent darkness, and then the camera would cut to the TARDIS interior set and we’d see the Doctor entering through two giant blocky doors faced with pizza-sized circular roundels, into the bright white control room, the central feature of which was a five-sided control console with a bobbing clear cylinder filled with lights and gizmos. 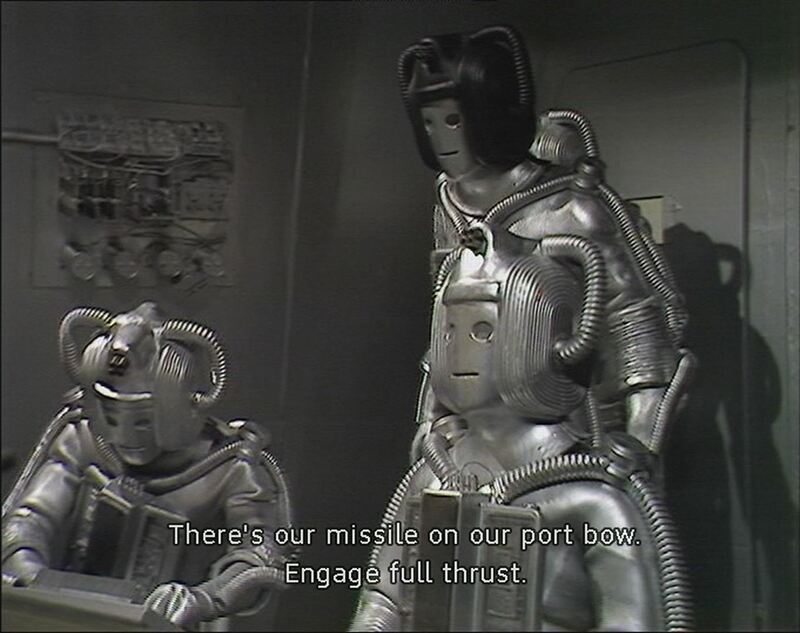 The Doctor would hit a switch, close the doors behind him, and with the manipulation of more dials and switches would cause the TARDIS exterior to fade from view, accompanied by its famous wheezing mechanical groan of a sound effect. Magic, I tell you! My wee mind was captivated by it all. I shortly began trying to craft my own Time Lord adventures by playing Doctor Who in the back yard, using the patio as my control room, a dog house as my control console and the chain-link side gate as my relatively smaller TARDIS door, leading me and my muffler to whatever monster was menacing the front yard. Since there were no Doctor Who action figures available in the U.S. (and they were pretty thin on the ground in the U.K. at that time) I also tried to create my own action figure adventures. Having no Doctor replica on hand, I substituted the most curly-headed, side-burn-bearing action figure I owned, a green-suited diver from the Fisher Price Adventure People scuba diver playset. And for a companion, I used the armless and legless red-headed princess from Fisher Price’s medieval castle playset. (Cause I’d somehow misplaced the lady diver who came in the scuba diver set.) These might seem like poor substitutions, but they were all I had. My TARDIS was even sadder, though. I had nothing approximating one, so rather than get my dad to build one out of cardboard (which I’m sure he would have done) I just used a mason jar. My Doctor Who toys were so low rent that I eventually gave up pretending they were even related to Doctor Who at all and just made up my own analog characters. I called my Doctor, Dr. Mum, named after the 1970s/80s cream deodorant, a small round container of which I used as my logo in imagined recreations of the theme song. (My theme was hauntingly similar to that of Doctor Who, I assure you.) I called the companion Princess Sally (since she a crown she had to be a princess), and I called their Mason jar spaceship the Blue Crystal (which was in no way blue, though the Mason jar itself lent something of a crystalline quality). The idea of owning an honest to goodness TARDIS toy, however, was something beyond the realm of possibility for me. I didn’t even wonder at the time if such a thing existed. I did not yet know about the Denys Fisher TARDIS toy of the late 1970s, recycled out of the Star Trek Enterprise toy set Fisher also made (a set that I actually had owned since age 5 or so). I did not yet know about the corresponding Tom Baker Doctor Who doll Fisher made, with real removable scarf. And I didn’t know anything about the Leela companion doll and would have found her confusing since PBS weren’t showing any of those episodes yet. Instead, I had my dreams. (The first TARDIS toys I ever saw were ones I imagined in actual dreams. And they were awesome.) It would be years yet before I got wind of even a TARDIS model, or set actual eyes on the TARDIS tin bank with the grinning image of Tom Baker beaming from its open door, let alone a TARDIS toy and action figures. In fact, by the time I saw such things I was well out of the typical action figure purchasing age range–not that I’ve let that stop me much, hence why I’m typing this. As my wife can tell you, I now own an excessive number of TARDISes. Most of them are in my office, taking up the space across the tops of two full book cases and, technically, spilling down the side of said case in the form of TARDIS string lights. Others live elsewhere, from my bathroom to my car, to my living room, to, occasionally, my bed. While it’s an impressive collection, by no means does it encompass the number of model/toy TARDISes that have been manufactured over the past 50 years. It’s actually pretty small comparatively (which is what I keep telling my wife). I have, as of this writing, around 49 of them (a nice number, though there is always the chance I’m forgetting one or two somewhere). We’re talking three dimensional TARDISes, too, not just pictures of them–of which I have more than a couple. I tracked down my first two back in 2002 or so. And since the show came back in 2005 and proved itself popular, new TARDIS products have hit the market each year. Why do I have so many? Why do I love them? Wellllll, there are many factors to the answer, but, if you distill it down to a base, I collect TARDISes because I feel like I owe it to that 4th grade boy back in 1980 who didn’t have even one TARDIS and who had to make do with a Mason jar. I really dig my TARDIS collection. As an ongiong exercise, and in an effort to produce more content for this blog, I’ve decided to write about each of them here, in no particular order, and with no real time table for doing them all. And you can keep up with them all with this LINK.